I want to wish everyone a blessed Christmas close to our Savior and close to loved ones. For those who can't be with loved ones or are ill or grieving, my prayers are with you. At least no one can keep you from our Savior and He is enough to fill us with abundant life and joy inexplicable! Rest in Him, trust Him and seek Him deeper. He is the answer to EVERYTHING! Thank you Father God for sending Jesus to save us! This is the set I made with my class. My original post along with directions for the base are here. I can't think of a better way to wish you a Merry Christmas than to send you to the designer's site as he's now offering the entire set with revised directions in book form, already printed! Just cut and assemble! He is a marvelous servant of God and has offered all his gifts for free all these years. This is the first thing I am aware of that he is selling and at only $12. 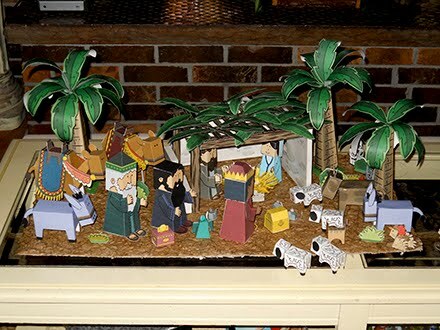 I can tell you that I paid Staples a LOT more than that to print all the pages of this marvelous nativity. So hurry over to My Little House and visit Didier! This is a great family activity and a great opportunity to teach the truth of Christ's birth straight from the Bible. Try Luke 2:1-20. Good to memorize too! In those days Caesar Augustus issued a decree that a census should be taken of the entire Roman world. (This was the first census that took place while Quirinius was governor of Syria.) And everyone went to their own town to register. So Joseph also went up from the town of Nazareth in Galilee to Judea, to Bethlehem the town of David, because he belonged to the house and line of David. He went there to register with Mary, who was pledged to be married to him and was expecting a child. While they were there, the time came for the baby to be born, and she gave birth to her firstborn, a son. She wrapped him in cloths and placed him in a manger, because there was no guest room available for them. I've shared LOTS of Christmas goodies this month. Be sure to scroll back in case you've missed anything and Merry Christmas! I wanted to make table runners and matching napkins for both my daughters and my sister. Frayed burlap makes such a great runner and I've seen so many great tablescapes built around it. 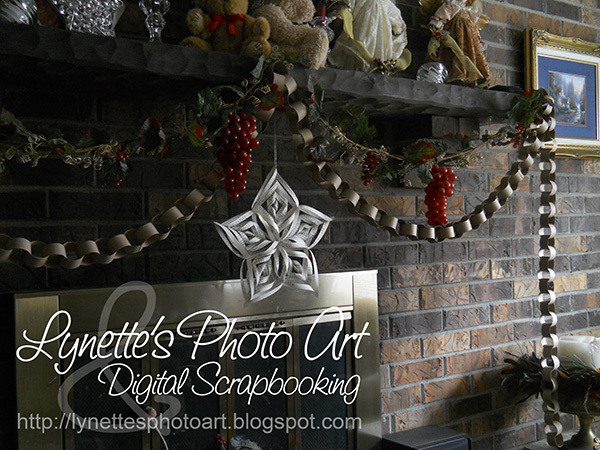 So, I wanted to make one side frayed burlap and the other side a seasonal fabric. That way no storage space is needed. When you don't want "winter", flip it over! I'd also seen a cleaver idea for fabric Christmas trees and wanted to try that for my matching napkins. So off to the store I went to find a pretty Christmas fabric! Hobby Lobby is by far my fav store, but they didn't have any that I liked, so off to JoAnn's. I found only one print I liked, and I simply adored it! It was a woodland scene with white and dark green trees, deer in clearings and tiny red birds, all dusted with a delicate sparkle! Loved it! $12 a yard and a coupon that really helped. Just as I finish them, I got my Pottery Barn catalog in the mail and what do I see? Almost identical print in dishes and napkins!!! Wow! Talk about being "on trend"! As to the "Christmas tree" two sided napkins, I made a set of four, but didn't love them in the end, so for the other two gifts I made traditional square napkins with mitered corners. 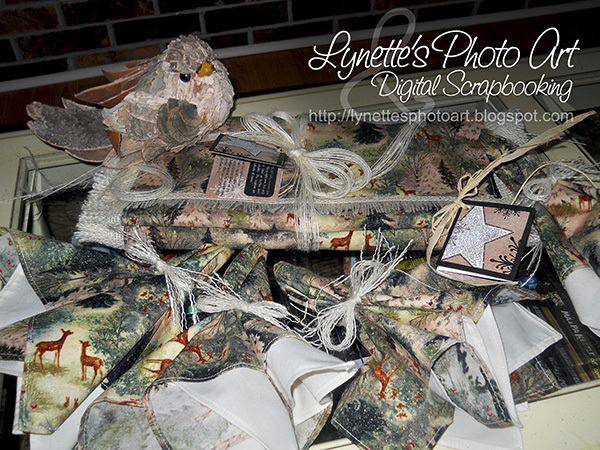 I made four of the cream muslin and four of the print for each set and arranged them in pairs bound by pretty bows. 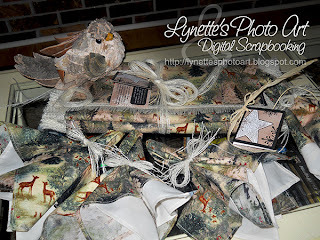 I simply adore the bows on everything I made from the threads I pulled off the burlap! I'm really happy with how it all turned out. I saved the leftovers for future projects. The napkins would be pretty on a plate or in a goblet. Below are the Christmas tree napkins. I made two with muslin out and two with the print out. I designed four page cards to tie to the sets with raffia. On the front page is a text star saying "MERRY CHRISTMAS" all the way around the star and the body of the star is the Christmas story from the Bible. 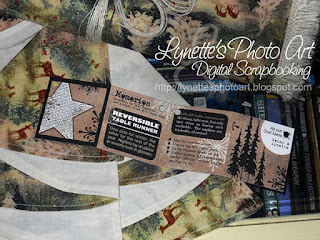 On the back page is a tree stamp by Tim Holtz and our signatures. The rest is all my designs including my Snowflakes Kit. 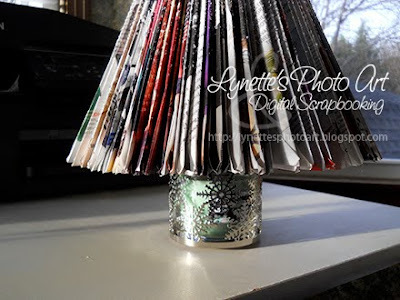 The middle pages are care instructions (you can't wash burlap, so spot clean) and use ideas. I love how the card turned out! Be sure to check back for more goodies and Merry Christmas to everyone! 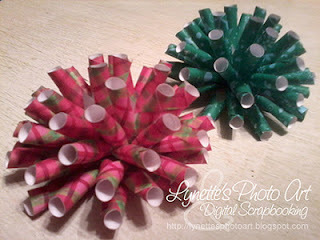 Yet another fun holiday paper-craft...I made these spikey paper bows from a tutorial at the SaltTree. I like her's MUCH better than mine. She said to shape them around a pencil. Apparently I used a fat pencil and she used a much thinner one. Yep...hers are MUCH cuter, but now I know the trick! You should really follow the link and look at her preview - a - d - o - r - a - b - l - e! There's more Christmas fun to come, so stop back soon and Merry Christmas! Today's idea is such a "no duh!" that it's odd I've never seen it elsewhere on the net. 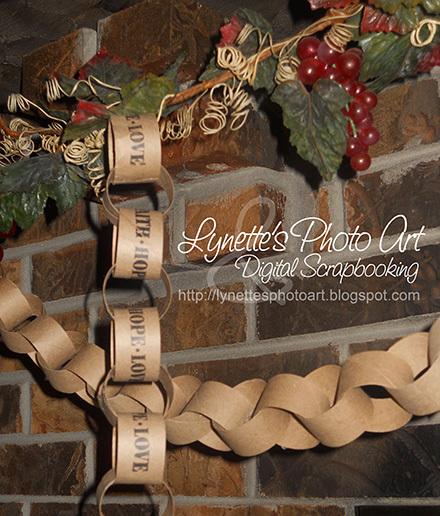 Turning toilet paper rolls into a paper chain! I had a huge number of rolls left that I had collected for my Bible class at church. I'd spent so long collecting them one at a time that when the church closed in May, I couldn't bring myself to throw them out. 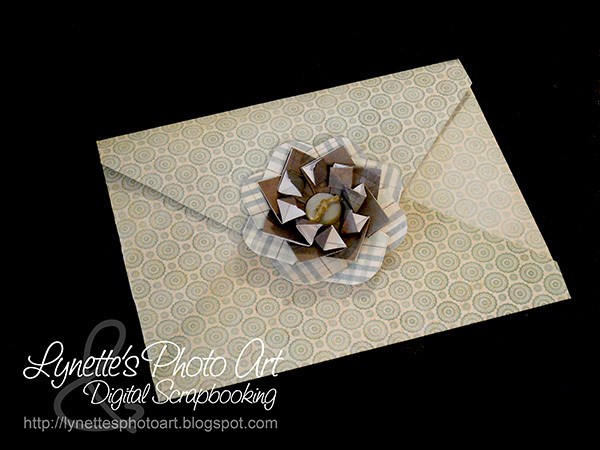 I love the natural look of the paper and the neutral color. I used some of them as trunks for my magazine trees (scroll back two posts), but still had tons of them. I slit them lengthwise with scissors and cut them into four equal strips on the paper trimmer. Then I used a tiny bit of hot glue to join them into the traditional paper chain. I just LOVE how it looks. The color, the texture, warm, homey and yet it looks very Pottery Barn to me. As soon as I was done I realized that I could have stamped on them while they were strips and set about collecting a few more to try it out. Oooh! I really love them both! And a great way to recycle too. I really enjoy re-purposing things that would normally become trash. Not only have you beautified your little corner of the world, but you have the satisfaction of keeping something out of the landfills! And yes, I only hung the stamped one there to take the photo...it didn't stay there! More goodies to come, so stop back soon and Merry Christmas! Today's Christmas treasure is one that's all over the web and it was high time I tried one myself. 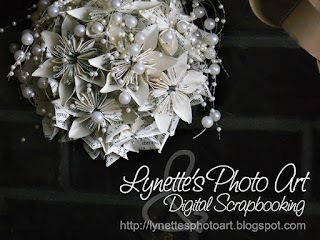 I hope you aren't getting tired of old book pages, since so much of what I have made this year is made from them. I find it calm, homey and sophisticated. The neutral color is easy on the eyes and the vintage feel with the print is just perfect for me this year. 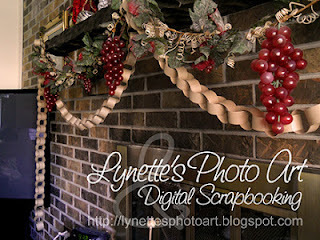 I used a tutorial at www.remodelaholic.com, one of my favorite blogs. I hope you are taking time to enjoy this holiday season with loved ones. It won't come again! I have more Christmas beauty for you today! 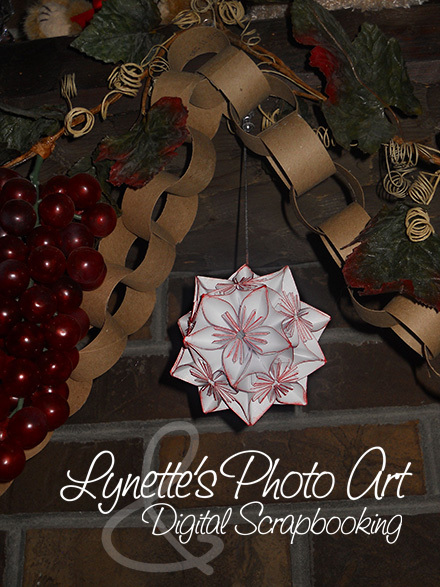 I started with a basic woven star tutorial I saw on line. 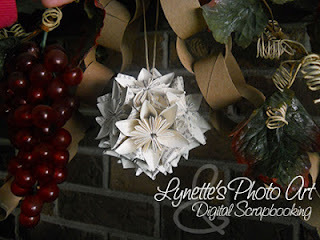 I used a beautiful two sided scrapbook paper and cut 12 strips 1/2" wide and 6" long on my paper trimmer and my finished flakes are 6" in diameter. I used Aleene's tacky glue for the assembly up to joining the points and switched to low melt glue. I like the extra positioning time Alleene's gives me, but the parts that really need to hold go faster with the hot glue and there's no need to clip or hold that way. I followed the directions up to where you place the two units back to back and assemble. I decided to nest them both facing the same way, just turn the top one so the points fit between the points on the bottom one. I could trim the dark strips behind the points, but I like how it makes them show up. I'm toying with the idea of maybe rounding the ends, or cutting to a point, though I'm not sure. Hmmm...what if I were to use a punch on the straight pieces...a row of circles, tiny snowflakes...before I assemble the two parts together? I think I'm going to have to try that one! They just cried for something in the center, so I looked through goodies I'd made in the past but not used. I found these lovely punched flake elements. 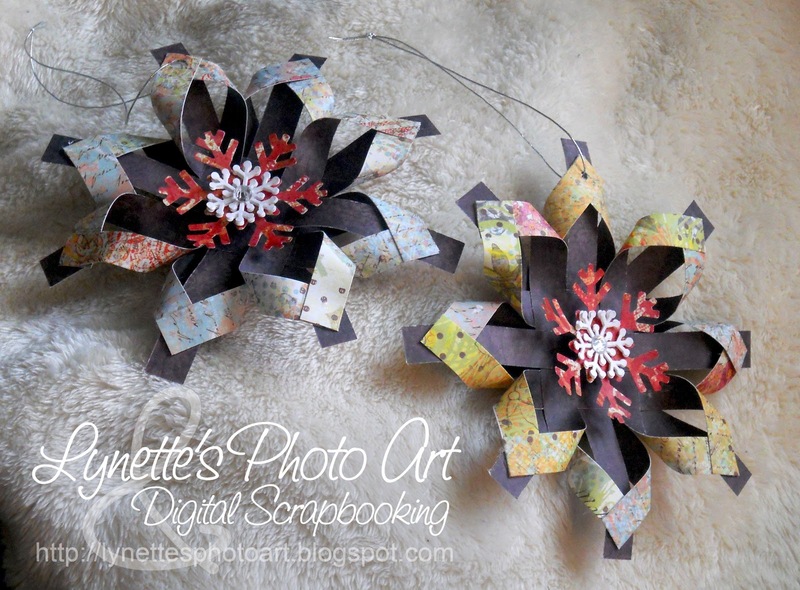 I had used the EK snowflake to punch the red mottled big flakes, then I had punched three white flakes with Martha Stewart's snowflake punch out of cardstock and glued them together to make them thicker. I glued them to the center of the red flake and bent them slightly up and away for dimension. In the center I had glued a small round silver rhinestone for sparkle. They were perfect for this project, only I didn't want them to lay flat in the center of the new flakes. I keep every scrap of art foam in a zip lock bag when I am working with it because it makes perfect, color coordinated, free (recycled) dimensional lifts. I got a brown one to match my new flake and glued it to the center, then glued the old flake assembly to the top of it. I punched a hole and threaded silver string for a hanger and voila! I love how these turned out! Stop back by soon as there are more goodies for you and Merry Christmas! To make these Kususdama Flower Ornaments, I trimmed the petals even narrower than shown in step 4. I wanted more background to show through them. You can use them to scatter on a table, sit on your tree, or string with hanging loops to actually hang. They really stay put on the tree without a hanger. How about connecting them to make garland?!!!! These are infinitely quicker and easier to make than the entire Kususdama Snowball. 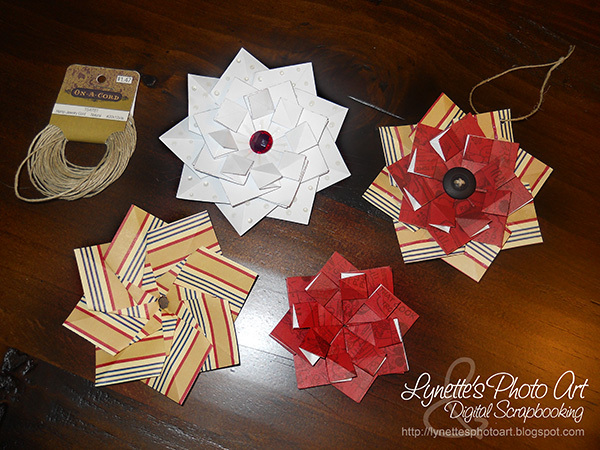 There are lots of tutorials on YouTube for the basic five and six petal Kusudama. There's one here. She used a glue stick. I started with Aleene's Tacky Glue but now use low melt glue and wish I'd done that from the start! 2. I started by cutting 2 1/2" squares of old book paper with my paper cutter. Six squares makes six petals = one flower. 1. This is a good activity to pass time while waiting somewhere. I put the squares in a snack bag with a slightly pointed wooden stick (to help open parts for folding), then put that bag in a larger bag. I keep it in my purse, neat, waterproof and tidy. Then when I have to wait somewhere, I can neatly and easily make petals and put them in the larger bag sitting in my purse. The yellow note is my reminder of how many flowers/petals it takes to make a normal ball for both five and six petal flowers. 3. Follow the tut link above to make the basic petals as you see at number 3. 4. Then I trimmed the petals with scissors, cutting off the glued end and keeping the open end. 5. Glue six petals together and you get the lovely flower at number 5. 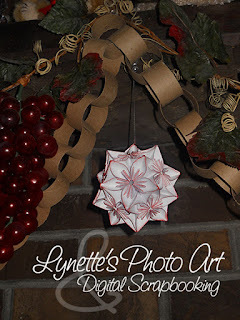 I'm sharing fun Christmas projects all month, so scroll back and be sure to drop by for the rest abd Merry Christmas! This one takes my breath away! It was a lot of work, but so worth it, don't you think? 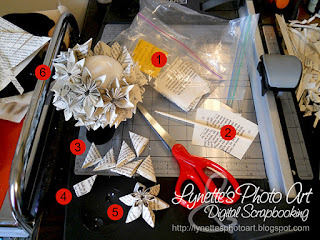 I wanted a larger six petal Kusudama ball, but all I found on line was to use larger squares to make the petals. That achieves a larger ball, but flowers are huge and you still only see two or three at a time. 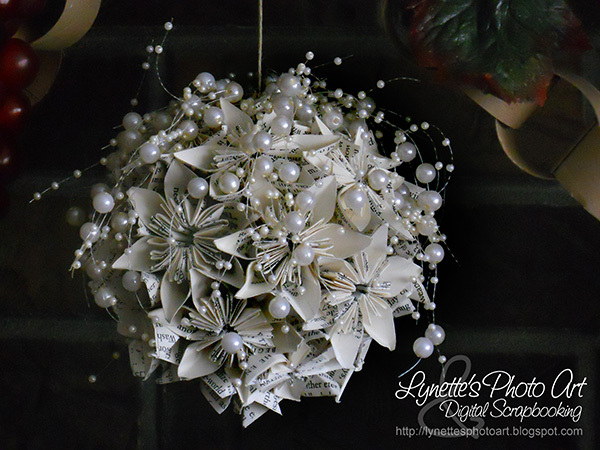 I envisioned a larger ball made of tons of smaller flowers - the same size flower I used on my other Kusudama post. 2. 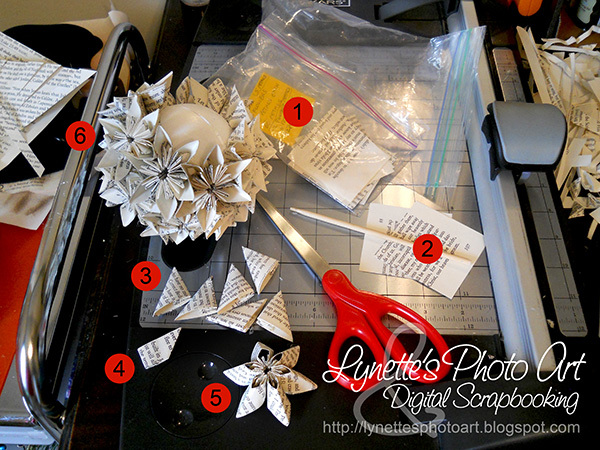 I started by cutting 2 1/2" squares of old book paper with my paper cutter. 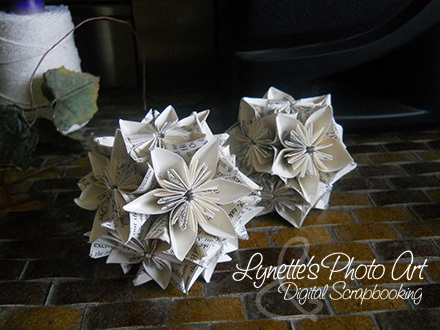 My 3" ball, prepared as I share below took 25 flowers of six petals each = 150 petals/squares of paper. 1. Since this is very time consuming, I put the squares in a snack bag with a slightly pointed wooden stick (to help open parts for folding), then put that bag in a larger bag. I keep it in my purse, neat, waterproof and tidy. Then when I have to wait somewhere, I can neatly and easily make petals and put them in the larger bag sitting in my purse. The yellow note is my reminder of how many flowers/petals it takes to make a normal ball for both five and six petal flowers. 4. Then I trimmed the petals with scissors, cutting off the glued end and keeping the open end, so that my flowers sit about 1" on top the 3" styrofoam ball. 6. Glue the smaller end of the flowers to the styrofoam ball, fitting them together until there is only a small area of ball uncovered. 7. (not shown) I tied a loop of twine for a hanger, then cut a paperclip in two and with it straddling the loop I pressed it into the ball in the opening and put glue over it. 8. 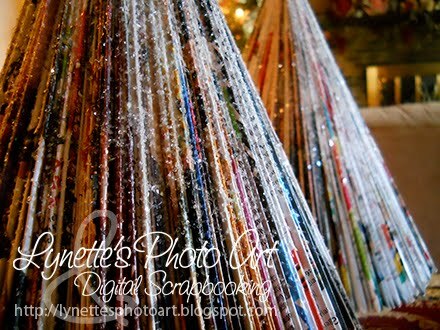 (not shown) I had bought this bead garland at Hobby Lobby last Christmas for half price. I pressed lengths of it into the glue in the opening around the hanger until I the ball looked just right! Isn't it just marvelous? If you make one I'd love to see it. I know that Kusudama in all it's countless variations is all over the net and wonderful tuts on YouTube, (like here), but I wanted to share how beautiful they are as Christmas decorations and tree ornaments. She used a glue stick. I started with Aleene's Tacky Glue but now use low melt glue and wish I'd done that from the start! Since I've had LOTS of waiting time in doctor's offices and before surgeries, tests and procedures this year, I've had lots of time to fold the countless little petals that make up these beauties. This is the first one I made. I had a message cube that wasn't sticky when you tore the pages off. Perfect squares I didn't have to cut...nice! I dabbed the edges of my finished ball with a red ink pad to make the details pop. Then I cut 2.5" squares from an old book and made five and six petal flowers. Assembling the five petal was easy...glue petal point to petal point. But though it seemed to me that it would be the same with the six petal, all my labor was ruined as it was too crowded and distorted some of the petals. With 72 individually folded petals and then all the assembly...it was sad to ruin. I scoured YouTube for directions and couldn't find any for the six petal, but saw that the more ornate Kusudama are sewn together. The one you see above I assembled by sewing five flowers into a ring, then five more into a second ring, and then sewing through the end of one single flower, pulling the string up through the center of both of the rings and then through the last single flower. I added a twine loop before closing it permanently. I also chose to add glue to the center before I added the last flower, just to make it sturdy. I didn't really trust the thread alone. And voila! A beautiful six point flower ball of vintage book pages! These will be gorgeous on a tree too, but I don't have one up yet. I have more goodies for you, so stop by again and Merry Christmas! Today I have a very pretty and versatile paper snowflake ornament for you. 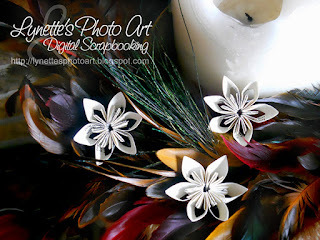 You can leave it alone or layer it with others to make a variety of pretties! I made them from the great tutorial here. I actually made these last year with my daughter who lost her house in the tornado. On the white one I added dots of Glossy Accents and a red rhinestone center. On the one to it's right I sewed one of my grandmother's old buttons in the middle. On others I used a corner punch to round the points, like the outer layer of the ornament below. I have LOTS more goodies for you this month, so I hope you'll drop by again soon and Merry Christmas! Hi! I haven't forgotten you! I haven't been able to post much this year due to health, but I have managed to make some Christmas crafts I'm really loving and wanted to share them with you and send you all my love and wishes for a wonderful Christmas and the best New Year yet! 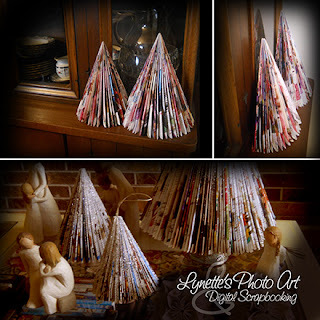 Last year I shared adorable trees I made from magazines and old books using a tutorial from The House That Lars Built. My original post is here. For trunks, I sat the big trees on candles in metal snowflake holders that I got from Bed, Bath and Beyond. 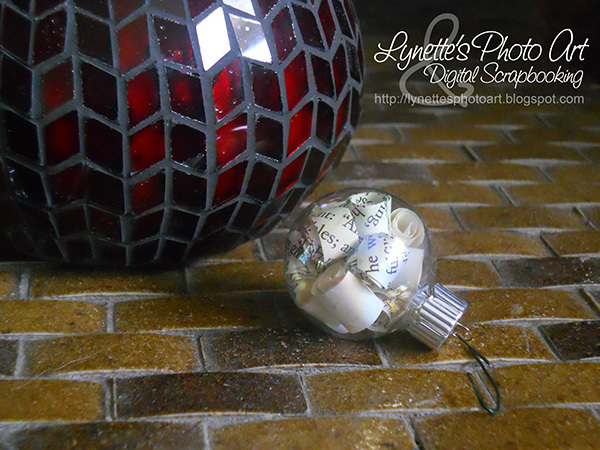 The smaller tree from the old book is sitting on a tub of glitter wrapped in brown paper bag. I have a narrow area on my china cabinet that I wanted a little forest on, but it's too narrow for the round trees, and I didn't want them all the same height. As most magazines seem to be the same "height", I trimmed the open top edge of my magazine to create shorter trees. I also cut the open side edge of the magazines to make narrower diameter trees. Then instead of gluing the two covers together to make it round, I left it open so the back was flat...just what you need to fit a narrow area! And they store small since they can fold right back up! 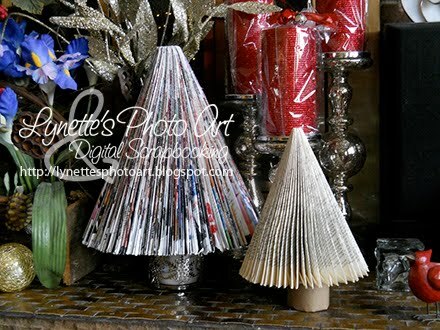 Then I cut a magazine down enough to make a folded tree ornament for the Christmas tree! For the smaller trees I cut a ring from a paper toilet roll for the trunk and glued them to the bottom of the tree. By slitting the toilet paper roll open vertically you can adjust the diameter of your trunk a you wish and the natural paper is perfect! Add a twine loop and you have an ornament for the tree. I keep meaning to try spray painting a tree...or a forest...or use colored glitter on them, but the truth is that in my home, the way they look with their natural pages and the gorgeous clear glitter I poured over them (on top of ModPodge) takes my breath away and I haven't gotten to the other ideas yet. I gave away all but the first one I made last year and love it so much I left it out all year. I am still delighted to walk through the room and see the sunlight dancing on the glitter, or the TV light doing the same. I have to stop and gaze, the sparkle taking me to a magical happy place. Sigh! And now that I have my little forest, methinks they will stay too! When you find something pure in life that makes you happy, you should go with it! I have a couple of other goodies I plan to share soon. Merry Christmas!